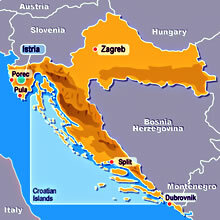 In Search of Istria, part 3: The popular resort town of Pore? 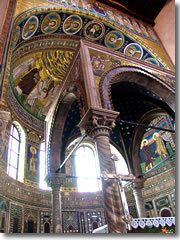 Poreč's Basilica of Euphrasius is swathed in early Byzantine mosaics.Poreč (Parenzo) has one of the top sights in all of Istria: the glittering 6th-century Byzantine mosaics in the Basilica of Euphrasius and the even more ancient floor mosaics from an earlier Paleo-Christian basilica housed in the atmospheric adjacent museum. Both make it well worth stopping here—and then moving right along. Why? Because, even though this small city is one of the popular resorts in Istria, there's little reason to linger after you've seen the basilica—precisely because it is Istria's most popular resort. Zagrebacka 9, tel. 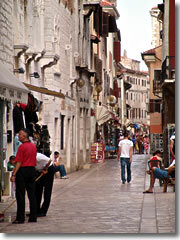 +385-(0)52-451-293, www.istria-porec.comPoreč suffers from mass tourism like nowhere else on the peninsula. The streets of the historic center—a Roman grid little changed in 2,100 years (the primary thoroughfare is still called Dekumanska, after the Latin for "Main Street")—are lined with souvenir shops, ice cream parlors, and lackluster restaurants, most of them fronted by noisy touts trying to hustle tourists inside. Sure, there are some lovely medieval houses in the old city, and there are even a few more sights, such as the weedy clump of desultory Roman ruins down near the end of the Dekumanska beside what was once a noble pink Neoclassical villa that is currently boarded-up and crumbling. But the crowds! Dekumanska, the ancient main street of PorečThe slippery marble paving slabs of the old center teem with vacationing Italians and Germans—not to mention Austrian, English, and Swedish empty nesters prowling for bargains on rural properties in what's being touted as "the next Tuscany." Most of them stay in the hotel complexes that sprawl in all their terraced cement glory around every (formerly) pretty little cove along this stretch of coast. But beyond the tourist blight, once the road south from Poreč turns inland, things get quite a sight nicer. The scraggly Istrian forest is interrupted only by the occasional small vineyard, fields of summer wheat flecked red with tissue paper poppies, or village restaurant roasting entire sheep on outdoor spits. Roadside stands offer fresh fruit and vegetables, or honey, olive oil, and rakija (the ubiquitous grappa-like brandy that seems to come in more flavors than Baskin Robbins offers), all free for the tasting. Just what the motorist needs: drive-through sales of the local moonshine—with free samples. Just a few miles south of Poreč, on the far side of the Limski Kanal, is a far better—or at least prettier—base for exploring Istria's central coast: the medieval town of Rovinj (Rovigno in Italian), founded on what was once a (barely) offshore island long since connected to the mainland.